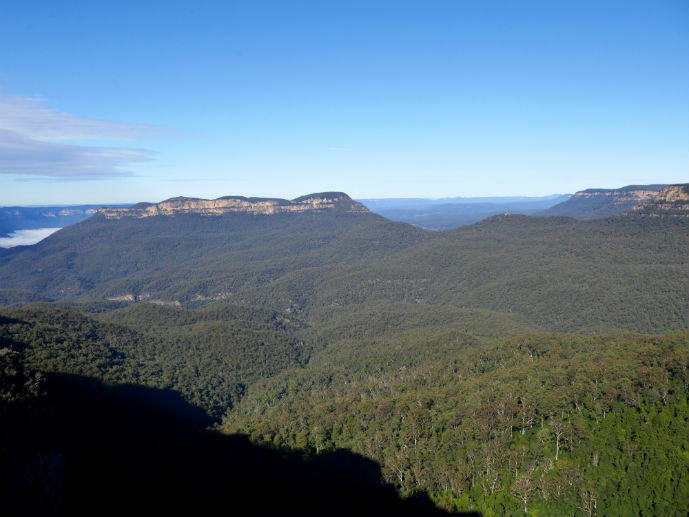 Once visitors to the Blue Mountains have checked out Echo Point and seen the Three Sisters and the Jamison Valley, they tend to head onto Scenic World. This popular tourist attraction is exactly as its name states, scenic. Located in Katoomba, just a stone’s throw from Echo Point and the town centre, Scenic World comprises four main attractions, the Scenic Railway, the Scenic Skyway, the Scenic Cableway and the Scenic Walkway. These together with the one of the largest souvenir shops in New South Wales, a cafe and a cafeteria, make up the Scenic World complex. 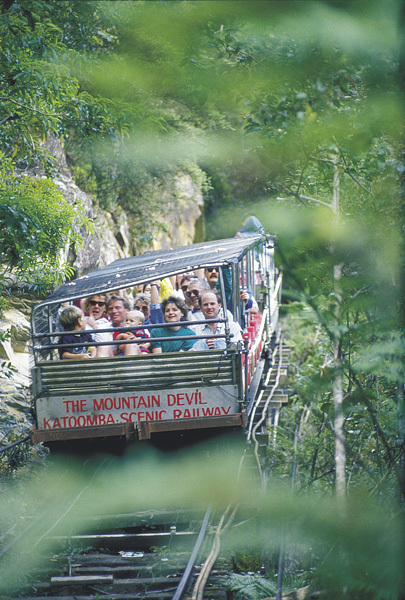 Scenic World was first established by the Hammon family in 1945, buying the land off the original owner John Britty North, who had opened the coal mines in Katoomba in the 1800s. 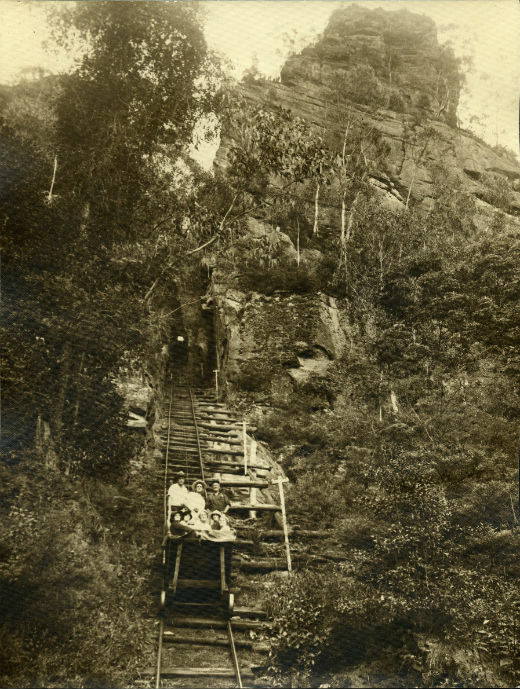 From 1928 the company running the mines decided to supplement their income by charging passengers sixpence to travel the incline on a purpose built 14 passenger car named “The Mountain Devil”. 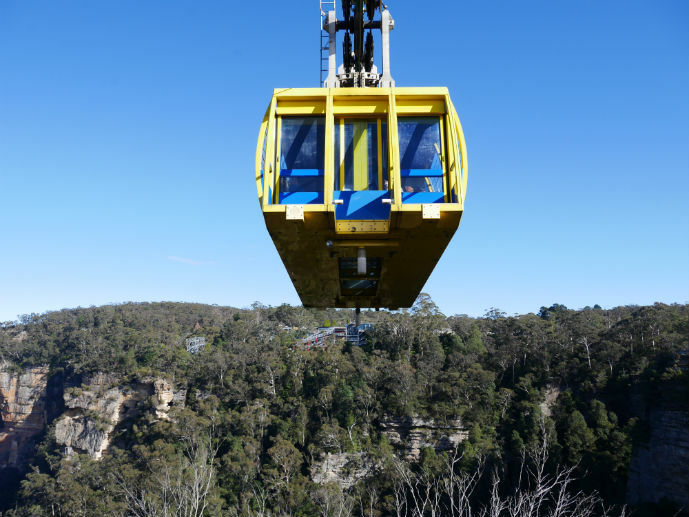 Since then the railway and the site itself have changed drastically and been home to many Australian firsts with it being home to the first cableway and revolving restaurant. The world’s steepest railway has had multiple upgrades (thank goodness!) with the most recent being in 2013. 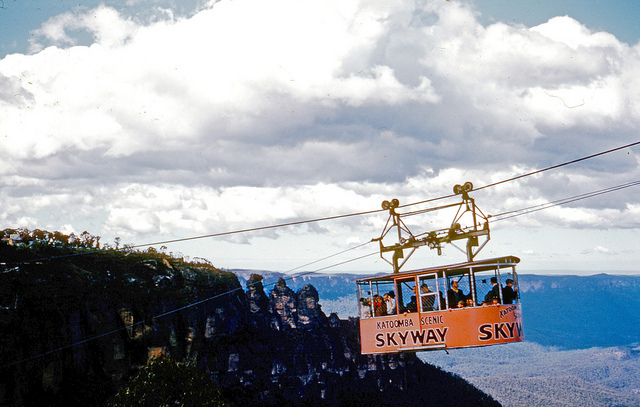 Additional attractions have been added over time with the Skyway in 1958 and the Cableway in 2000. As a kid I grew up visiting Scenic World on family holidays, as I am sure most Sydney and surround area residents have also. Revisiting brings back so many fond memories of fun and slightly terrifying experiences riding the attractions. Despite having to pay quite a hefty fee to enjoy them these days, I still found it to be reasonably good value and just as fun as I remember. 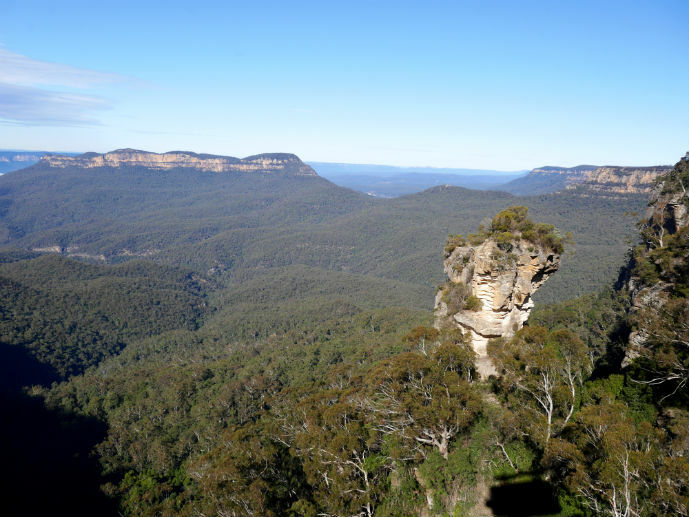 Here is my guide on what to expect when visiting Scenic World in Australia’s Blue Mountains. As mentioned above there are four attractions to visit at Scenic World and if you want to get the best value I suggest purchasing the Ultimate Discovery Pass. This pass allows you to use all of the attractions as many times as you like for a full day. This means you can ride the railway 10 times if you like. When you buy you’re tickets you will be given a Discovery Guide which shows the location of all of the attractions and where they will take you. All can be accessed from the main building. My recommendation for visiting them all in just a few hours is to see them in the order below. This will allow you to seamlessly go from one attraction to the next without any hassle. 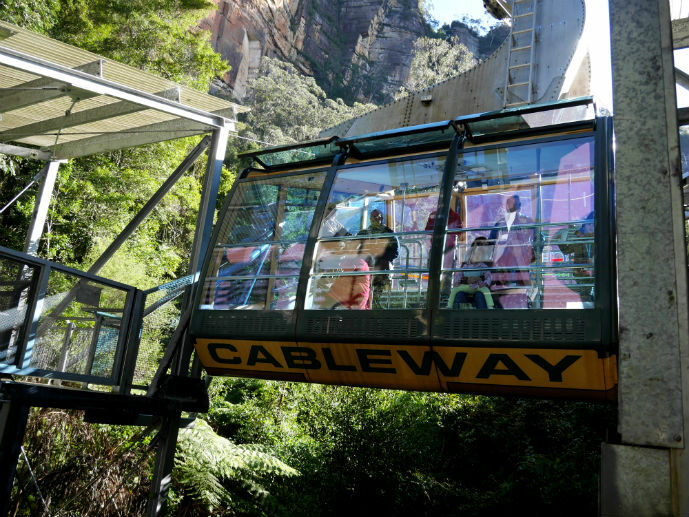 The Cableway is the steepest and largest cableway in the Southern Hemisphere and descends 545 metres into the Jamison Valley. From the fully enclosed cabin you can look out of the large floor to ceiling windows over the spectacular Jamison Valley, the rainforest below and the sandstone cliff faces to the right. On the few minutes it takes to descend, you catch glimpses of the Three Sisters, Orphan Rock and Katoomba Falls. For those who don’t like heights or just the idea of being suspended by only a cable, I can assure you that being on-board feels very safe. The car moves so calmly that if you had your eyes closed, you wouldn’t even know you were moving. 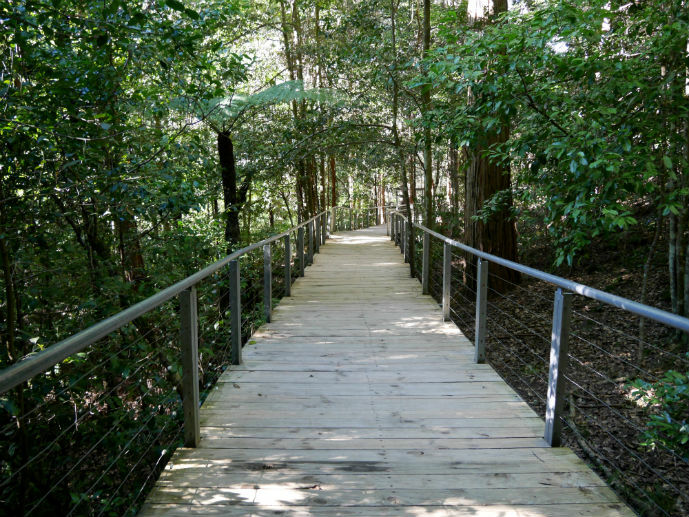 The Scenic Walkway is 2.4kms of elevated boardwalk through the rainforest at the bottom of the cliffs. 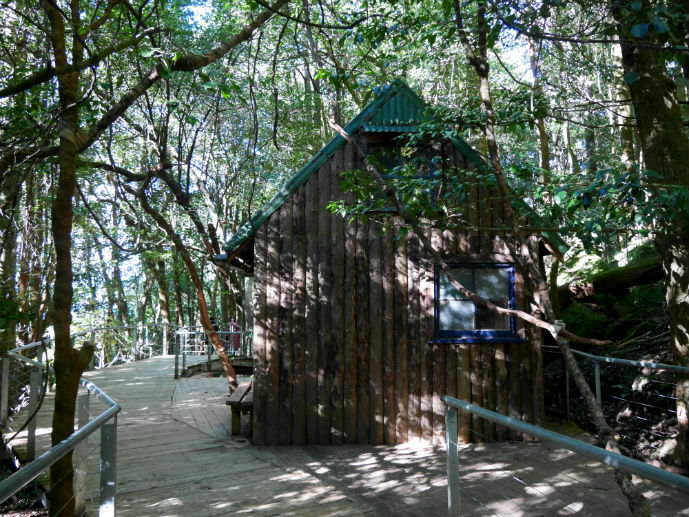 Once you disembark the Cableway you have three options for walks along the Scenic Walkway. Option One – Take a short 10 minute walk to the Scenic Railway station. This walk is wheelchair accessible meaning no steps and it is relatively flat and easy for all walking abilities. 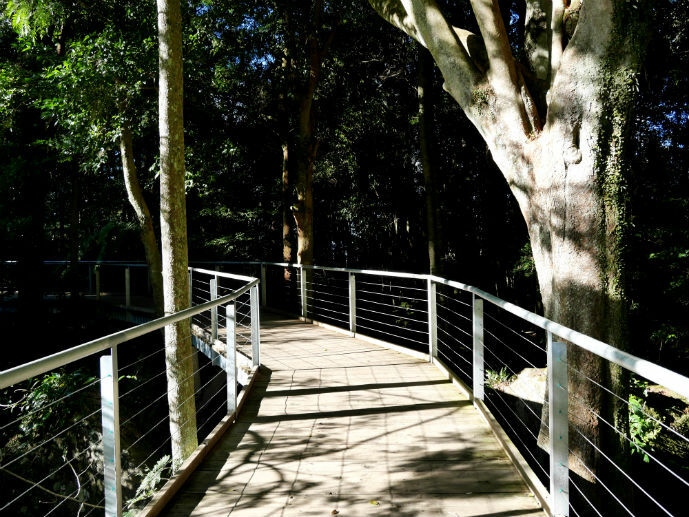 Option Two – A 30 walk which takes you further down into the rainforest and then back up, joining about halfway along option one, ultimately taking you to the Scenic Railway station. There are a few steps and small inclines on this walk which require a bit more energy than option one. Option Three – This 50 minute walk down into the rainforest again, covering most of option two and detouring deeper into the rainforest. Again you will encounter steps and inclines along the way. This walk joins up with both option one and two, ultimately taking you to the Scenic Railway Station. Whichever walk you choose to take keep your eyes peeled for birds, especially lyre birds that are frequently spotted drinking from the streams. All of the walks are well signposted with information boards along the way that tell you about the rainforest and the history of some of the items left from the areas mining past. 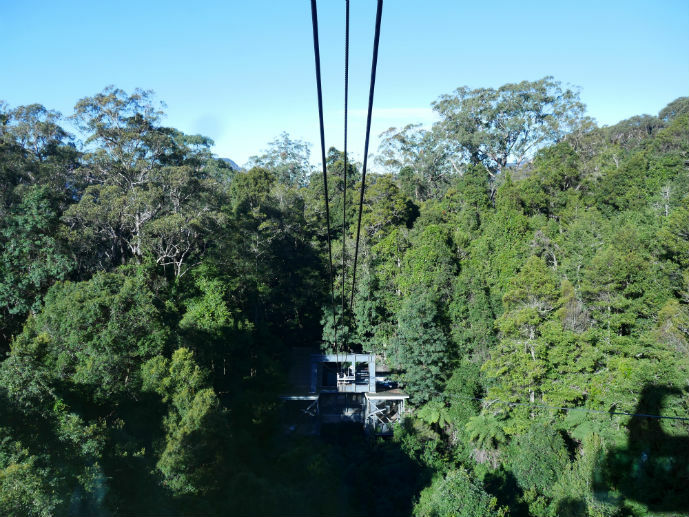 Of course, if you don’t want to take the rainforest walk and/or the Scenic Railway, you can just board the Cableway again back to the top. 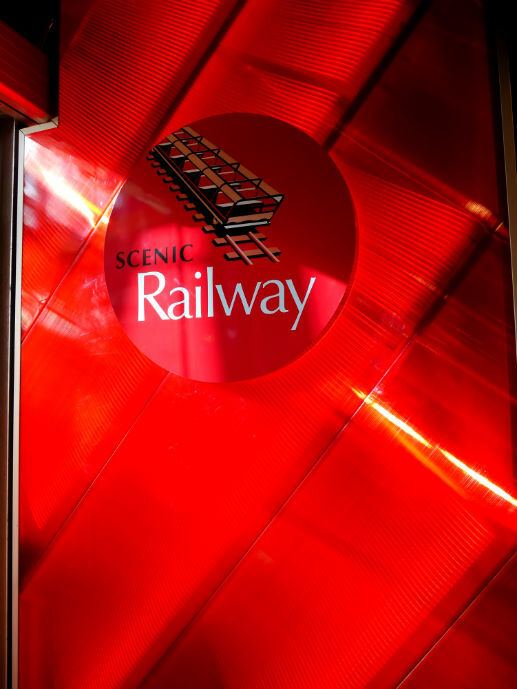 The original and main attraction at Scenic World is without a doubt the newly renovated Scenic Railway. 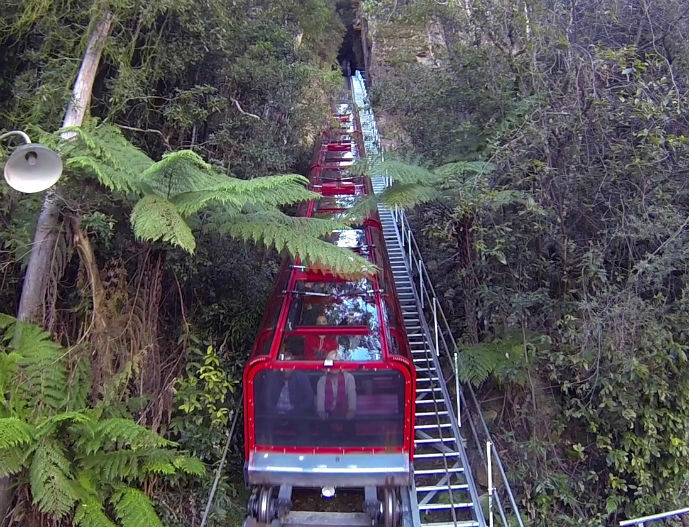 As the steepest railway in the world, you will travel in the 84 seat glass roofed red train carriage that travels on a 52 degree incline up the cliff face and through a short natural sandstone tunnel. The newly revamped carriages let you adjust your seat in three positions, ‘cliffhanger’ which makes the incline 64 degrees, relax into the ‘laidback’ position or stick with the original seating at 52 degrees. Whatever you choose, be prepared to hang on as you feel the incline get steeper and steeper as you ascend the cliff face. This is a thrill ride so be prepared to scream! 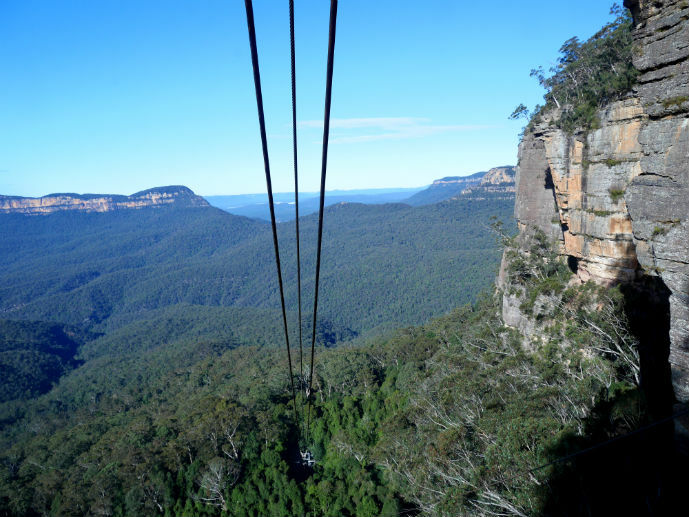 Once you’ve finished screaming, take in the stunning views of the rainforest and sandstone cliffs up close and glimpses of the Jamison Valley as you near the top. Suspended 270 metres above the rainforested valley below is the glass floored Scenic Skyway. 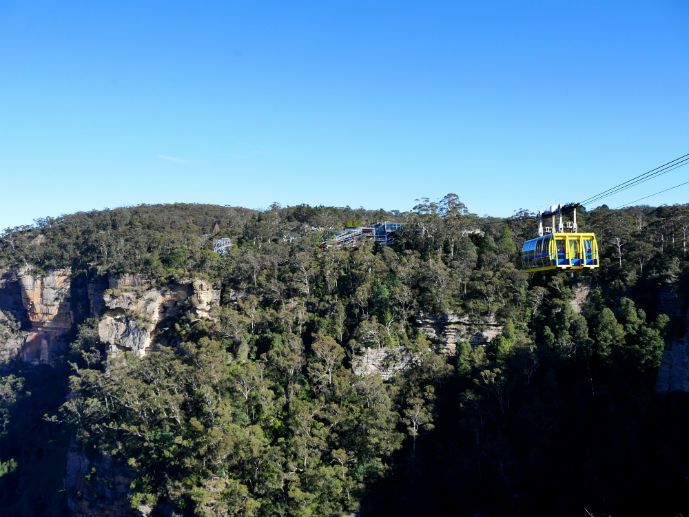 The short ride from the main building of Scenic World to the east station offers 360 degree views of the Jamison Valley, Three Sisters and the best view of Katoomba falls you can get. If you’re a little worried about heights and the glass floor you’ll be happy to know that only a small section in the middle of the cabin is glass which is frosted over at the beginning of the journey and revealed by the conductor just as you get out over the valley. On a calm day you can barely feel the movement and the cabin stays level the whole journey. When you arrive at the east station you have to option to stay on-board and go straight back to the main building or you can disembark and visit the lookout just below the station or link up with walks that take you to Echo Point and down to Katoomba Falls. Want to experience the attractions of Scenic World right now? Check out my video. Scenic world is located on the corner of Violet Street and Cliff Drive in Katoomba, about 3km from the town centre and train station. 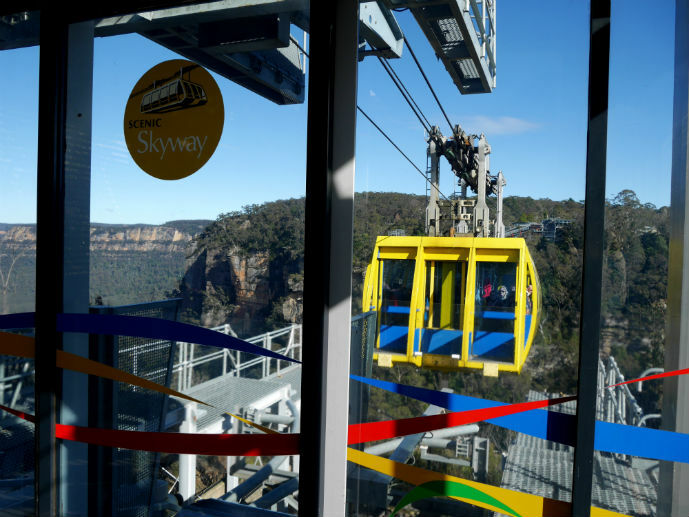 The Blue Mountains Explorer and Trolley Buses both stop at the entrance to the attraction and there is a large multi-storey car park onsite available free to visitors. The attractions are all open 365 days of the year from 9:00am to 5:00pm. The Ultimate Discovery Pass can be purchased onsite at $A35.00 for adults, $A18.00 for children aged 4-13, $A32.00 for concessions and $A88.00 for a family pass. You can visit the Scenic World website for more information. Which attraction do you want to ride the most? Thanks Agness. The view certainly is amazing. I visited the Blue Mtns many years ago and remember it being such a wonderful day trip. Great tip about the Ultimate Pass. Thanks Charles. Glad you have fond memories of your trip. It’s one of Australia’s biggest drawcards I think. Loved Scenic World! It looks like you had a fabulous day for it as well. So lucky. When we went, it was so misty that you could barely see a thing. We caught a brief glimpse of the Three Sisters before the cloud swirled back around them. The cable car at Scenic World was just eerie – the fog was so thick that after about 10 seconds, you couldn’t see anything supporting you. It was like the car was floating inside a cloud, and then every so often dark sinister treetops would loom out of the mist and then vanish as quickly as they appeared. It was a bit disappointing how little we could see – but it was certainly atmospheric! I’ve been to Katoomba dozens of times in my life and never have I had such good weather like this trip. Atmospheric is definitely the perfect way to describe it in the fog Katie. Planning to visit Katoomba on the first week of July this year. Was wondering if there will be a good view on the rides even though it’s the Yuletide season? July is the perfect time to be in the Blue Mountains. All the photos in this post were taken at the end of June so as you can see the view is pretty amazing. Blue Mountains look incredible. Your pictures have done it a lot of justice. Can’t wait to visit when I’m back in Sydney in December! !